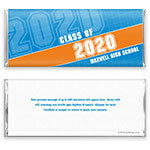 This clean, simple wrapper is an ideal choice for any type of graduation celebration. Design: Grid pattern with sports-inspired graduation banner. Personalization: Graduation year and school name, back message.